Swimming can be one of the most challenging sports to capture adequately on camera. Not only do you need the perfect angle for catching the most dramatic parts of a stroke, you also have to time your shots for when the swimmer’s face comes up for air. 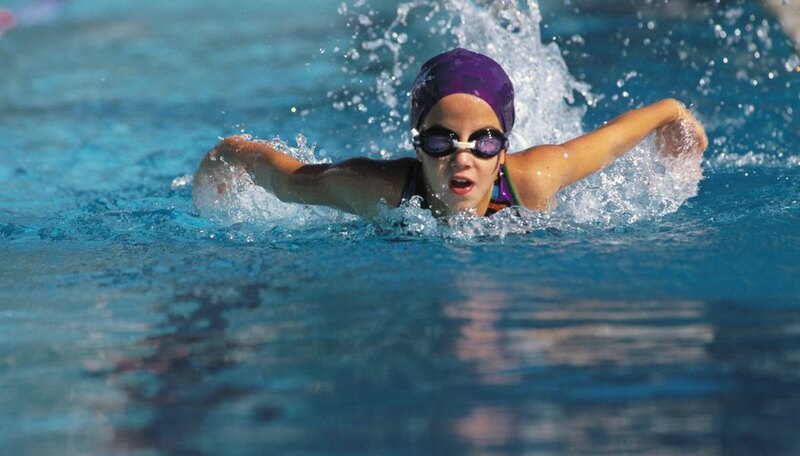 Borrow several techniques from professional photographers to help you get the perfect shot when capturing the swimmers in your life in photos. A moving target is not easy to capture in photography, especially when the face of your subject is submerged in water half the time. One technique for getting clear shots is to position your tripod or camera stand at the end of the swimmer’s lane. This ensures that you capture a full arm spread for butterfly and backstrokes, which can be difficult to capture at an angle. By setting up your camera in line with the swimmer, it also ensures that you’ll get symmetrical shots of both the back and front of the swimmer without having to dodge swimmers in other lanes. When trying to catch a shot of the swimmer breathing, set up a shot from one of the corners of the pool nearest your subject to capture their face when turned to the side. Capturing the athletic intensity of a swimming stroke at the perfect moment requires both skill and a little luck. Outside of the starting block, there are a few windows of opportunity for getting an easy shot, and most of the time you’ll have to synch your trigger finger with rhythm of your subject’s breathing. Some races, says experienced sports photographer Peter Read Miller, such as the 50-meter freestyle, go by so quickly that swimmers rarely even pause to take a breath. If you have an ear for rhythm, hum the swimmer’s cadence to yourself or gently tap your toe in your shoe to help you match your subject’s rhythm. Even when you do land the perfect angle, focus and timing, there’s always a chance that your subject won’t be in the most flattering position. Swimming is an intensive aerobic exercise, and sometimes your subject’s face will be wild-eyed and open mouthed as a result -- or worse, hiding behind a soggy armpit. Take as many shots as you can to increase your odds, and don’t worry if only one photo out of 100 is worthy of being in Sports Illustrated. Invest in an automatic shutter switch that can capture photos more quickly than you can manually. For intimate angles, get as low as possible to the pool deck. You can also increase the dramatic effect of a shot by setting your shutter speed at a minimum of 1/1500 or higher and f-stop to f8 to capture the full shape of the water splashes and stop the motion. For noncompetitive events, you can also use a waterproof camera to capture the scene from underwater, or even from the swimmer’s perspective if you don't mind getting all wet.